A Japanese astronaut has apologised for wrongly stating he has grown 9cm (3.5in) since arriving at the International Space Station (ISS) just over three weeks ago. Norishige Kanai said in fact he grew by 2cm, blaming "a measurement mistake". "I'm very sorry for tweeting out such fake news," he tweeted in Japanese. His original incorrect claim sparked global fascination among social media users. Astronauts grow an average of between 2-5cm in space. Mr Kanai originally tweeted (in Japanese): "Good morning, everybody. I have a major announcement today. We had our bodies measured after reaching space, and wow, wow, wow, I had actually grown by as much as 9cm! But later on, he tweeted that his Russian commander on the ISS, Anton Shkaplerov, was sceptical, "so I quickly measured myself and was roughly 182 cm. 2 cm plus my height on earth". "So it was a measurement mistake (? ), but it seems many people are talking about it. "I have no back pains, and actually the pain around my neck and shoulders is gone, so I doubt I'm 9 cm taller. Flight Commander Shkaplerov would know these things, he's such a veteran." 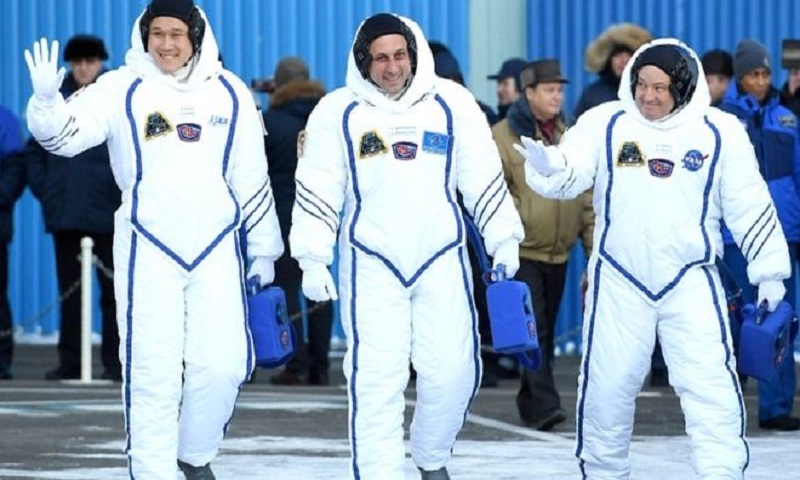 Mr Kanai said he was a "bit relieved", adding: "I'll probably fit into the Soyuz when I go home."